Identifying larval stages of marine fishes in the open ocean is difficult because the young fishes often bear little or no resemblance to the adults they will become. Confronted with a perplexing fish larva collected in the Florida Straits, Smithsonian scientists turned to DNA barcoding, which yielded an unexpected discovery—a match between the mysterious fish larva and adults of a new species of sea bass discovered off the coast of Curacao. The team's research is published in the May 13 issue of PLOS ONE. Most marine fishes have a pelagic larval stage that drifts in the surface or near-surface currents of the ocean―an environment very different from the one they inhabit as adults. Two different environments often require two different body shapes and appearances, resulting in larvae that look very different from the adults of the same species. The larva at the center of this study first came to the team's attention from a photograph without identification in another research paper. The scientists recognized it as a member of the sea bass family Serranidae but were intrigued by its seven very elongate dorsal-fin spines. "This feature isn't known in any Atlantic sea bass larvae, but it is similar to one species of Indo-Pacific sea bass," said David Johnson, a zoologist at Smithsonian's National Museum of Natural History. "We initially thought the larva must have been caught in the Indo-Pacific Ocean, but we were wrong." 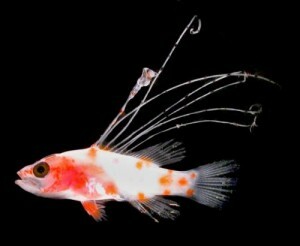 The fish larva in the photo was in fact caught in the Florida Straits. The team obtained the preserved larval fish for further study and were met with an immediate mystery—a DNA sequence from the specimen did not match any known fish species. That, along with unique morphological features, led the scientists to begin describing the larva as a new species despite the absence of adults. Meanwhile, in a separate project, Smithsonian scientists were using a manned submersible to explore the deep-reef fish species off of Curacao in the southern Caribbean. Among the fish collected were "golden basses," which the team identified as Liopropoma aberrans based on general color pattern; however, genetic analyses revealed more than one species. Combining this new genetic information with available DNA barcoding data for all western Atlantic sea bass specimens yielded an unexpected discovery: The larva from the Florida Straits is the pelagic stage of a cryptic new species of Liopropoma from southern Caribbean deep reefs. The mystery was solved, and a new species of sea bass—now known as Liopropoma olneyi—was discovered. The team named the new species in honor of a deceased colleague, John E. Olney, who studied and taught courses about marine fish larvae. "This was one of those cases where all the stars were properly aligned," said Carole Baldwin, a zoologist at Smithsonian's National Museum of Natural History. "We discover a new species of sea bass on Curacao deep reefs that just happens to be the missing adult stage of a larval fish from Florida, which we only knew existed because it was included as 'decoration' in a scientific publication. What a great little fish story!" Deep reefs, which extend from depths of 150 to more than 1,000 feet, are underexplored ecosystems worldwide. "You can't access them using traditional SCUBA gear, and if you're paying a lot of money for a deep-diving submersible that goes to Titanic depths, you're not stopping at 300 or 800 feet to look for fishes, said Baldwin. "Science has largely missed the deep-reef zone, and it appears to be home to a lot of life that we didn't know about." Researchers are now able to study deep reefs in the southern Caribbean because of the availability of the Curasub submersible, a privately owned, manned submersible capable of descending to 1,000 feet. The work off Curacao resulting in the discovery of L. olneyi is part of the Smithsonian's Deep Reef Observation Project. "We are only beginning to understand the phenomenal diversity of life that inhabits deep Caribbean reefs," said Baldwin.